When deciding what movie to see at the theaters Thursday night, I compared new releases on Google Trends. Of the new releases this weekend, Eye in the Sky stole the show in terms of search traffic proportions, God is Not Dead 2 had meager traffic, and Meet the Blacks was a goose egg across the board. Seemingly off the map of Google searches, I was intrigued, and decided to table Eye in the Sky for my Friday matinee. The question is, then, was it a worthwhile choice? 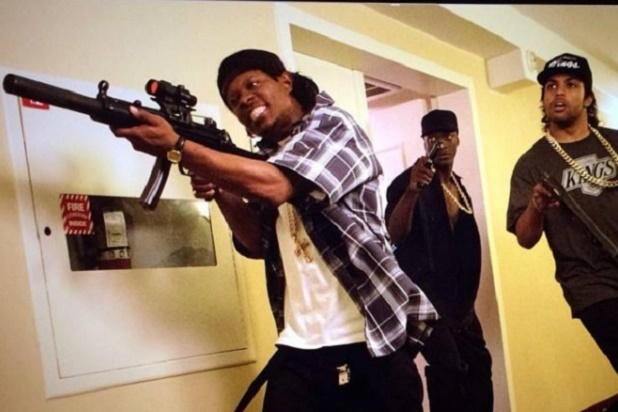 Straight Outta Compton is a biopic centering around legendary rap group N.W.A. The film chronicles the rise of artists Dr. Dre (Corey Hawkins), Eazy-E (Jason Mitchell), and Ice Cube (O’Shea Jackson Jr.) from the unforgiving streets of Compton, California to super stardom as hip-hop pioneers. All the while, bitter racial tensions flood the streets and the nation as the characters encounter multiple run-ins with police and follow the Rodney King trial on television.